The crisp lettuce, plump tomatoes and fresh, fragrant herbs you’ve grown in your garden over the past few months were as amazing to look at as they were to have on your plate. But let’s face it: chillier times are upon us! Community garden manager, Courtney Anne Craft, was kind enough to share her best tips for preparing your garden for winter. She also offers ideas for keeping a little summertime freshness in your life through the cold days ahead! Why not make your garden last as long as you can? Half hoops, tarps and box covers can all be used to protect your produce from the elements so you can continue getting garden goodies late into the season. Heftier vegetables, such as carrots, kale, beets and parsnips, can actually benefit from being left in the ground for longer. “They wont grow any more once temperatures drop, but they’ll essentially be stored in the soil,” says Courtney Anne. Additionally, a bit of a frosty kiss can even add some extra sweetness! These plants react to the cold by converting their starches to sugars. Once the end of the season rolls around, pulling out your annuals—any plants that won’t come back the following year—becomes a priority. Remember to compost! Removing spent annuals clears space in the garden and ensures you won’t have to deal with soggy dead plants once the snow melts in the spring. It also makes space for planting edible, green manure. 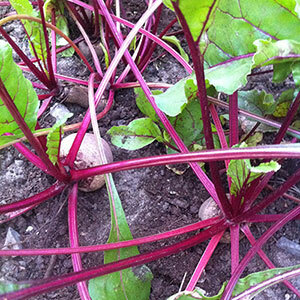 You work hard to maintain the health of the soil in your garden, and green manures can help. Green manures are cover crops you plant in the fall. The seeds lay dormant through the winter, and are the first signs of life in your garden come spring. Once they flower, these crops can be turned under. They’ll benefit the structure of the soil and release important nutrients, such as nitrogen, potassium and phosphorus, back into the soil. 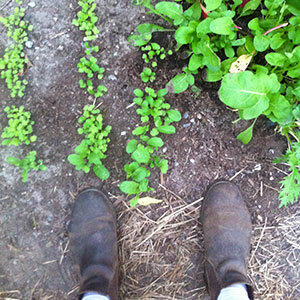 Courtney Anne chose fava beans and hairy vetch for her green manure this year. Mulching is another smart step to take when preparing your garden for winter. Last year, Courtney Anne covered her entire garden with straw, creating a protective barrier between her soil and the snow. Once it dries in the spring it can be raked together to create garden pathways. That’s what we did with last winter’s straw mulch. Mulching also protects the root structure of annuals left to winter, and helps keep the plants warm until spring. 1. Bring them indoors: Dig up a portion of your woody herbs, such as sage, thyme and oregano, and plant them in pots you can store in your kitchen. “They’ll need a little love, but they’re pretty hardy plants,” she says. 2. 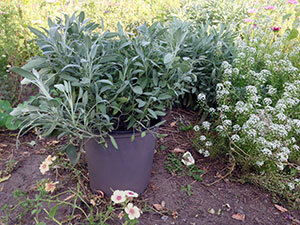 Cut back the rest of the herbs in your garden substantially: Not only will this encourage re-growth in the spring, but you can also dry what you’ve cut back to use during the winter. 3. 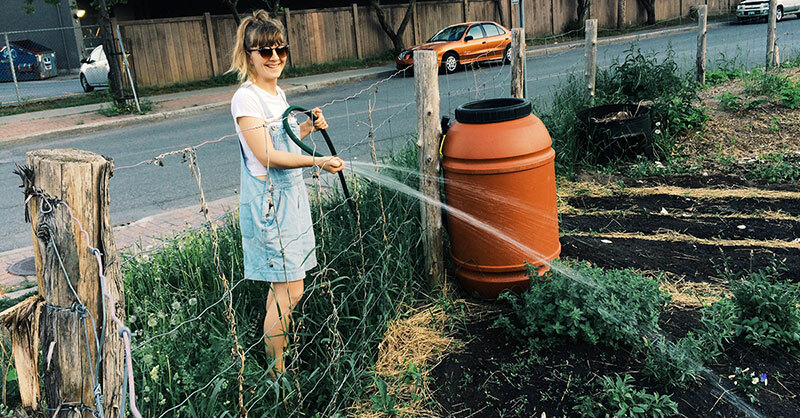 Preserve, preserve, preserve: This is hugely important for Courtney Anne, as her garden has such a high yield of certain produce. There are many amazing courses, workshops and articles about preserving the fruit and vegetables from your garden, so find a plan that works for you! Cracking into a jar of tomato sauce you made with your summer tomatoes in December is a pretty nice feeling. Want to learn more? Toronto’s FoodShare is offering a Putting the Garden to Bed Workshop Oct. 8, 2015. Know others great tips, or of workshops happening in your city? Share them below! Courtney Anne’s little plot of land is located in downtown Ottawa, and is owned by the region’s only 100% sustainable seafood supplier—The Whalesbone. While The Whalesbone is a supplier, it also has two restaurants in the city: The Whalesbone Restaurant and the Elmdale Tavern. Rather than using the garden’s yield for its own purposes though, The Whalesbone gives Courtney Anne free-reign to donate whatever she produces to local charities. This year’s crops were taken to the Parkdale Food Centre, which provides nourishing meals to people in need.